The International Health Humanities Network provides a global platform for innovative humanities scholars, medical, health and social care professionals, voluntary sector workers and creative practitioners to join forces with informal and family carers, service-users and the wider self-caring public to explore, celebrate and develop new approaches in advancing health and wellbeing through the arts and humanities in hospitals, residential and community settings. Professor Paul Crawford defines this fast-growing field of Health Humanities as follows: "Health Humanities champions the application of the arts and humanities in interdisciplinary research, education and social action to inform and transform health and social care, health or well-being. It aims to be inclusive of viewpoints and contributions from within and beyond medicine; value the experiences and resources of the public; explore diverse approaches to achieving, maintaining or recovering quality of life; and strives for demonstrable impacts, not least in providing new evidence and insights for the education or practices of those planning, organising or working for the health of any population." Supported by the Arts and Humanities Research Council, this initiative begins a new era in developing the way that arts and humanities knowledge and practice can enhance health and wellbeing. On this website, members can log the impact of language, literature, history, theology, law, philosophy, visual, performing and multimedia arts, as well as area studies, media and cultural studies, for example, in enhancing the health and wellbeing of society. Informal carers, service users and the self-caring public are invited to share their ideas of how arts and humanities have benefited them and may benefit others experiencing a particular challenge to their health and wellbeing. Nurses, doctors, occupational therapists, psychologists, dentists, physiotherapists, social workers, childcare and school workers, alternative and complimentary therapists, as well as those who have traditionally drawn on the arts and humanities such as music therapists, dance and drama therapists, poetry therapists, art therapists, bibliotherapists and sports therapists, are invited to join and report on successful, innovative projects and events in this field. Whether you are giving or receiving information on this website, we hope you find new people and practical resources around the world that help bring the human back into health. The 2019 International Health Humanities Conference will be held at DePaul University in Chicago, Illinois, from March 28-30. This multi-disciplinary and inter-professional conference will bring together scholars, educators, artist, and healers to explore the many and varied environments of health humanities scholarship and education. How do we imagine, define, experience, and contour the social, cultural, physical, and emotional environments we occupy and move through? We invite responses to and further articulations of this focalizing question in various formats: formal papers (20 minutes long), panels (75 minutes long; 15 minutes for Q and A should be factored into the proposal), posters, and flash presentations (5-minute presentations in which a speaker describes an area of research). We encourage submissions from related disciplines such as health humanities, medical humanities, narrative medicine, literature and medicine, age studies, disability studies, deaf studies, gender studies, fat studies, queer theory, ethnicity and race studies, feminist science studies, cultural and media studies, popular culture, and queer and feminist bioethics, and sexuality studies. 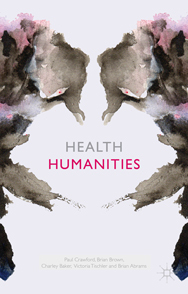 Send abstracts (250 words long for papers; 150 words for posters and flash presentations; 500 words for panel proposals) to: (abstracts2019@healthhumanitiesconsortium.com) by September 30th. For more information, visit the conference website or contact either Craig Klugman or Michael Blackie. A new national award on the UK, The Health Humanities Medal has been sponsored by the Arts and Humanities Research Council and Wellcome. AHRC published a new report. Exploring Mental Health and Wellbeing. The report showcases a number of key research programmes advancing innovative approaches to achieving mental health and wellbeing. Discover more about the new Nottingham Health Humanities Research Priority Area. Eating disorders are often perceived as a ‘female-only’ problem despite their rise among boys and men. Our AHRC-funded research network ‘Hungry for Words’ focuses on the problems and perspectives of articulating, communicating and understanding anorexia nervosa and other eating disorders affecting men and boys. Our approach is interdisciplinary and takes the very different aspects of this topic into account. The Birth Project is now recruiting MOTHERS and MIDWIVES (student, practising, retired) to join research workshops to explore their experiences of birth. We are looking for participants who have had difficult experiences of birth, and who are interested in exploring their experiences creatively. Workshops to start in February 2014 in Sheffield, UK.